An apple of Virginia origin arising sometime in the 18th century, but never very well known or widely distributed. It is quite an attractive yellow apple popular for making a thick, dark yellow applesauce. It was also very popular for making apple brandy. It was said that if a grower had several Parmer trees in his yard, the neighbors knew he was most certainly making illegal brandy! Fruit is small to medium, conical-shaped, with deep yellow skin and irregular patches of russet all over. The dark yellow flesh is fine-grained, crisp, and subacid in flavor. Ripens July to August. I have been frustrated so far in adding Pomme Grise to my little home orchard; will try again next year, but considering alternatives such as Parmer. In your experience, is a Parmer tree vigorous or middle of the pack or small? I am in Spokane, WA, zone 6, where climate is rather arid and chill hours are about 2000 hours. I’m sorry to hear of your difficulties with Pomme Gris. This apple actually does well for us and is one of our more reliable producers. It has a nice crop of fruit this year when almost 50% of our crop was lost to a late April freeze. 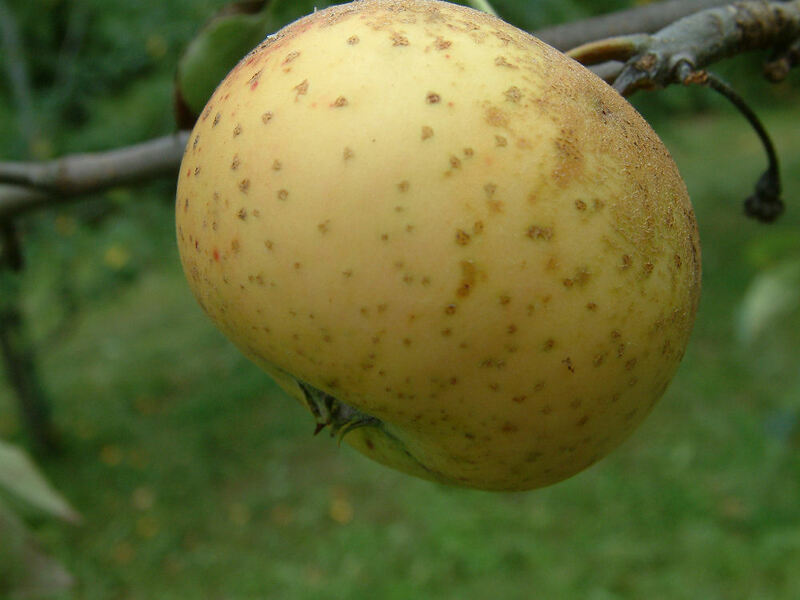 Regarding Parmer, it could be called a semi-vigorous grower and produces good-tasting apples but they are susceptible to apple scab to which the Pomme Gris is almost immune. Apple scab is probably not a significant problem in Spokane with the drier climate. As for the size, this depends primarily on the specific rootstock on which the tree was grafted. What exactly are the problems you are having in successfully establishing Pomme Gris at your location? Is it a growth problem or disease-related? We expect to have both trees available this fall so contact us in September for more information if you wish to get one or both trees. Thanks for writing. Have an enjoyable and productive summer.